It's five years since Thunder announced they were retiring and ended their career with the "20 years and out" live dates. Except they then played Sonisphere a few months later, and since then have proved that retirement just isn't for them as they've played gigs regularly since then. One highlight of the year for Thunder fans is always their Christmas show. The location moves around - it's been in Manchester and Nottingham in recent years and in 2013 they held it at the Civic Hall in Wolverhampton. In fact it sold out so fast they played two shows - the 20th and 21st December. 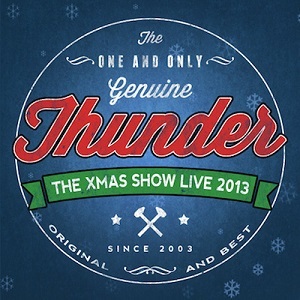 Part of the ticket price included a CD of the show, so last month fans who had bought tickets for either date received a copy of "The Xmas show live 2013" on CD (it was included in the ticket price). The CD contained highlights of the show recorded over the two nights. 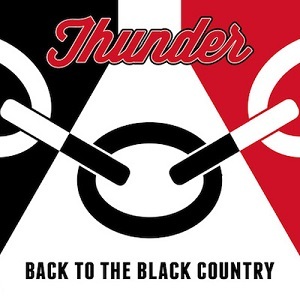 That CD is now being released for anyone to buy and coincides with the release of a second CD from the same shows - "Back to the Black Country"
Unlike a typical Thunder gig, these shows, and the albums, aren't just Thunder doing a "best of" type set - a quick look at the track listings shows no "Love walked in" or "Backstreet symphony" for instance. Instead the shows were split into two parts - an acoustic set followed by an electric set, with both sets including a mixture of Thunder songs and cover versions. Looking at the track listings you'll see that of the 15 songs on "The Xmas show live 2013", five of them also appear on "Back to the Black Country". That doesnt mean they're the same though - remember that both night's shows were recorded, so you actually have two slightly different versions of these songs. Between the two albums then you've got 24 different songs plus 5 alternate versions. Both albums include some great covers - on "The Xmas show 2013" I'd pick out "Pinball wizard" and "Merry Xmas everybody" and on "Back to the Black Country" I'd pick out "Saturday night's alright for fighting" (Elton John cover), "Long train running" (Doobie Brothers cover) and the superb acoustic version of Neil Young's "Heart of gold" as highlights. For Thunder fans these albums are a great chance to hear the band doing something different to their usual sets. While some people may feel disappointed that some of the band's biggest song's aren't included on these live albums, most fans of the band will have these on other albums so are unlikely to miss them. These two albums are definitely well worth buying for fans who were unable to make it to one of the live shows. Fans who attended the shows will have "The Xmas show live 2013" so for them "Back to the Black Country" is an essential purchase.